Clear body with red and white spots, red and white saddle on the abdominal hump, and long, upward curving rostrum with red and white on the tip. Claws and legs have red and white banding patterns. They live in groups. Indo-West Pacific; Red Sea and Eastern Africa up to New Caledonia and Japan. They can be found in crevices, under ledges, caves in cleaner stations, where they gather in large quantities to clean fish, in a depth range of 2-66 meters. Sexual reproduction, including precopulatory mating rituals and indirect sperm transfer. They feed on parasites (which they take of the fish they clean), algae and plankton. 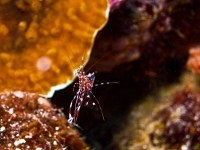 There is a wide variety in cleaner shrimps, and even within the Urocaridella genus. Further study will have to turn out whether these are all different species or actually belong to the same species with geographical variations in appearance.